Is your business looking for a way to become more environmentally friendly while still using branded pens as a promotional tool? Our promotional Eco Pens are stylish as well as being environmentally friendly, with a range of products for different budget restraints. Our Bamboo Retractable Pen and the JS Bamboo Pen have a stylish external bamboo look. 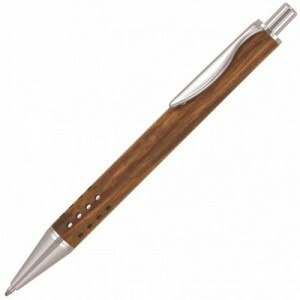 The JS Bamboo Pen has silver accents while the Bamboo Retractable Pen features black and silver accents. Both pens are budget friendly and have a large logo print area. The Eco Ball Pen comes in five different colours and is made of 79% recycled plastic. With a great sized logo print area, this pen is affordable for any business, while the simple style of this pen will never go out of fashion. The JS Eco Pen is a simple affordable environmentally friendly with a range of clip colours. With two logo print spaces, this simple pen will help promote your business. Our top of the range eco pen is the Wooden Portofino Ballpoint Pen. With a wooden barrel, two branding spaces, and the option to laser engrave your business branding, the Wooden Portofino Ballpoint Pen is perfect when you want to be environmentally friendly while still having a high range stylish promotional pen. Branded eco pens are becoming popular promotional tools with many businesses and now your company can stand up and be environmentally friendly while still promoting your services. Forget the traditional ballpoint promotional pen, and choose an environmentally friendly branded Eco Pen for your next promotional tool.